Just like the well-received PyeongChang Olympics, South Korea has vowed to make the ongoing PyeongChang Paralympics a cultural event as much as it is a sporting event. True to the host nation’s pledge to make the events a “culture Olympics and Paralympics,” 600 culture-related programs have taken place or are slated to occur during the Paralympic Games in Gangwon Province, to end Sunday. South Korea boasts a rich culture embedded within its more than 4,000 year history, which PyeongChang is eager to share with visitors from abroad. The experience commences from the very doorsteps of Gangwon Province, in Jinbu Station where a traveler stepping off the KTX comes across various art and virtual reality exhibitions and other programs that operate from 10 a.m. to 5 p.m. every day. Throughout the Winter Games, 42,000 people have accessed the programs. Step deeper into the province, and you will find other events that invites you to experience the country’s deep culture. PyeongChang Olympic Stadium remains closed until the Paralympics closing ceremony this Sunday, but the Olympic Plaza that holds the venue has plenty of features to enjoy. Traditional Korean Pavilion holds performances of traditional Korean gukak music, gurus and demonstrations on other time-honored art in Korea. Even on days without performances, visitors can observe paintings exhibited inside the traditional hanok. Avid fans of Korea’s modern art will be excited to come across the works of Paik Nam-june, Lee Gyeong and Lyu Jae-ha at the Culture-ICT Pavilion. “Light PyeongChang,” is a three-part exhibition that holds works by these artists, including “Project Mapping” by Lyu and collaboration by Lee and Paik. 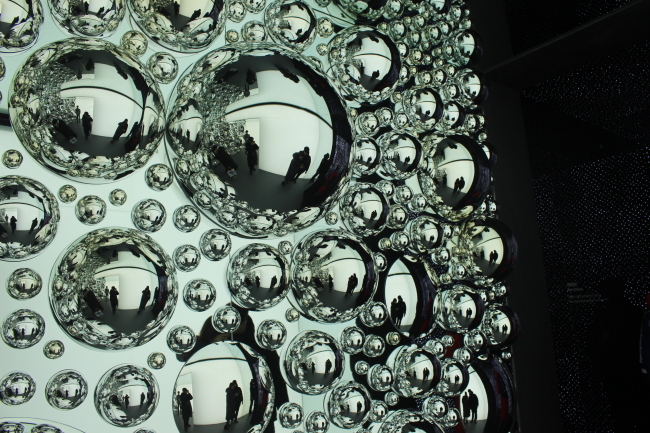 Paik’s most noted works like “Turtle” and “M-200” are also present at the venue. ICT Pavilion is more than just art. The second floor of the building holds exhibitions of cutting-edge 5G technology and various virtual reality programs, including one that simulates a bobsledding experience. Another eye-catching feature involves a pair of robot fish, which visitors can control in a game of virtual hockey. Sixteen robot fish can be found across the Olympic venues, along with 19 other robots, including 10 guide robots, two vacuuming robots and two waiter robots. Hallyu content is available at the nearby Live Pavilion, which holds hologram concerts of top K-pop stars and other virtual reality programs. The entrance fee for the Olympic Plaza is 2,000 won. The venue is located in Daegwallyeong-myeon, PyeongChang-gun, Gangwon Province. One of the most popular events at the Gangneung Olympic Park is “The Great Journey of Bandabi,” held every day at 3 p.m. Sixty people take part in the parade led by the mascot of the Paralympic Games, Bandabi, partner to the Olympic Games’ Soohorang. Busking, street dance and other performances take place at the park, and a line of customers typically forms outside PyeongChang Super Store that sells related merchandise. The entrance fee for the park is also 2,000 won per person. For more information on culture programs presented by the organizing committee of the Paralympics, visit www.pyeongchang2018.com/ko/culture/index. Dagewallyeong Snow Festival ended with the Olympics in late February, but the nearby RE2018 exhibition hall is hosting the “All Together Art Exhibition” through Sunday. Twelve artists across the province are presenting their work, which can be viewed free of charge. Those wishing to visit can do so from 10 a.m. to 6 p.m., with the last entry at 5:30 p.m. To get there, take one of the shuttles operated by the Paralympic organizing committee and get off at the PyeongChang Olympic Plaza stop. It is a 1.1-kilometer walk from there. Potato Flower Studio in PyeongChang-eup is also holding an exhibition of works by 20 artists from 16 countries. 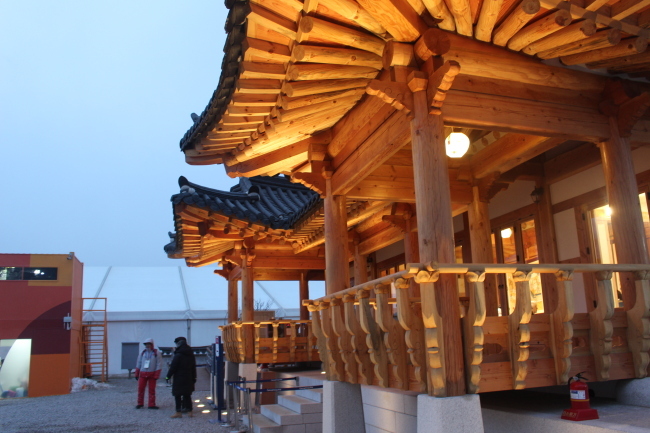 PyeongChang Olympic Market, a traditional market in the region, is somewhere visitors can taste food made with buckwheat flour, which are specialty in Gangwon Province. On Saturday, “Bongpyeong-Jang” -- meaning Bongpyeong marketplace -- opens in Bongpyeong and features memil noodles, memil bread and much more to make the visit worthwhile. An exhibition hall dedicated to Lee is also near the marketplace, and street performances mixing traditional and modern music also take place. For more information on must-try delicacies in the region, see khnews.kheraldm.com/view.php?ud=20180205000219. The culture-sharing experience does not end with the Paralympics. As part of efforts to promote Korea’s traditional culture to the outside world, the Korea Cultural Heritage Foundation on March 22 and March 29 will hold madang nori performances at the Pungryu folk theater at the Training Center for Important Intangible Cultural Properties in Seoul. Madang nori, which literally means “play in the backyard,” are traditional Korean comedy plays with masked actors, music and dancing. It was a main pastime for common folk in ancient Korean kingdoms. Each performance is held at 7:30 p.m., and lasts for 90 minutes. The shows are available to visitors aged 8 and up, and the entrance is 5,000 won. For information on tickets, visit https://booking.naver.com/booking/12/bizes/148839 or call (02) 3011-2178. But beyond the performances, the best experience can be to mingle with locals and experience what they call “jeong.” The closest translation is “affection,” but the word also implies the tendency to be nice, friendly to others -- regardless of their relation to you -- and the sense of being welcomed and cared for even in the company of strangers. For foreign visitors, the festivities of the Paralympics may be a chance to be plunge into the deeply rooted culture of jeong that the country has boasted for years.